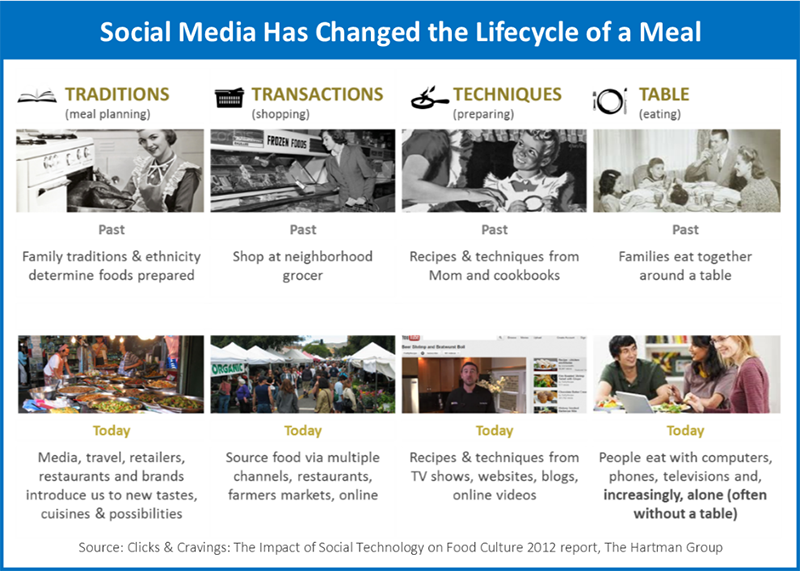 Six years ago, in one of our earliest studies on the intersection of food culture and technology (Clicks and Cravings 2012 report), we documented how consumers were increasingly eating alone, even at home. Not to worry: We found they were digitally connected by mobile phones and social media, all of which hinted at the slow and potential demise of the traditional dining room and social eating conventions like sit-down "meals." At the time, it seemed to paint a rather depressing picture of an eating culture unwinding itself toward completely new conventions historically stigmatized under the phrase "table for one" with “one is the loneliest number" playing in the background. And yet, as our research proceeded over the next six years, we began to understand a lot more about the concept of eating alone, and within the context of a great deal of eating "occasions"-based research (in which we examined things like solitary eating, traditional meal dayparts and snacking), we began to learn that while eating alone was increasingly prevalent, it was also actually something people enjoyed — and (gasp) actually looked forward to. Eating Alone as “Me Time.” Eating alone is an occasion for catching up with email, social media, TV or a good book. Rather than lament time spent alone, people embrace and even feel empowered by it. They’re quite happy eating alone on certain occasions when they want time to themselves to relax and enjoy their meal in solitude. Because they are largely instrumental affairs, 53% of breakfast occasions are eaten alone, as are 44% of lunches. When it comes to why they say they eat alone, 32% of solitary eating occasion reasons relate to personal pleasure. Eating Alone as a Necessity. Many households, especially those with older children, have a main cook who prepares a household meal, but the family doesn’t eat it together. Other priorities — typically schedules or picky eaters — take precedence. While some are content with this way of eating, parents are much more likely to wish for more meals eaten together, indicating that this part of the erosion of mealtime isn’t always welcome. 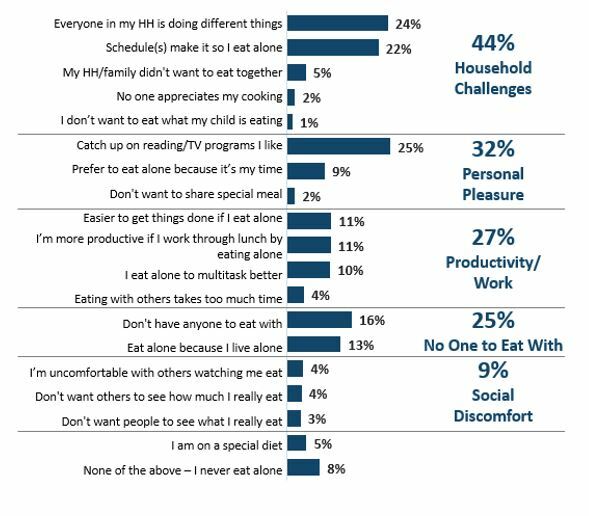 A full 44% of reasons for eating alone can be attributed to household challenges. Whatever their reasons for eating alone, we find that younger and older consumers eat alone for different reasons. For example, eating alone out of social discomfort or personal pleasure is more pronounced among Millennials than older consumers. Millennials, and to a lesser extent Gen X, also eat alone to get more done at work. Boomers, on the other hand, are much more likely to say they either live alone or have no one to eat with. 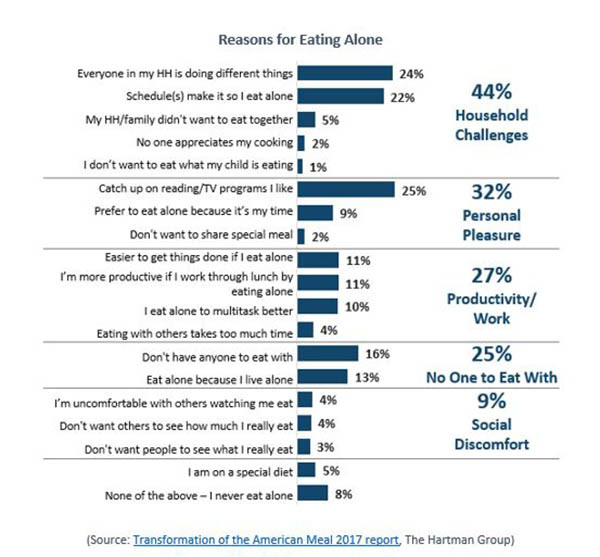 Eating alone can be said to reflect evolving notions of health and wellness that have led many consumers to reexamine the “traditional” American meal. Daily rhythms focused on three “square” meals a day have undergone a long-term transformation as traditional diets and eating routines have yielded to a more fragmented, less structured way of eating that includes snacking, skipping meals, eating alone and a high level of social acceptance of personal dietary preferences. With eating alone becoming the norm, consumers are seeking ways in which to celebrate it. So the roast beef dinner has evolved into what is often a search for customizable components that can be crafted to form a meal for one. Food to go, portable foods and premium “snacks” all can be crafted together to form a meal for one. For many consumers, solitary dining is a new way of eating that can be customized and personalized. Packaging, such as used in Trader Joe’s salad kits or Sabra Hummus singles, can shift solitary dining from a lonely occasion to something fun by serving as an interactive and pleasurable distraction. In food retail, deli food stations such as olive bars enable consumers to have higher-quality, global food experiences on everyday occasions by providing a combination of premium, small tastes. As they eat alone, consumers increasingly aggregate snack items to become a meal, thereby underscoring just how much eating styles have changed. 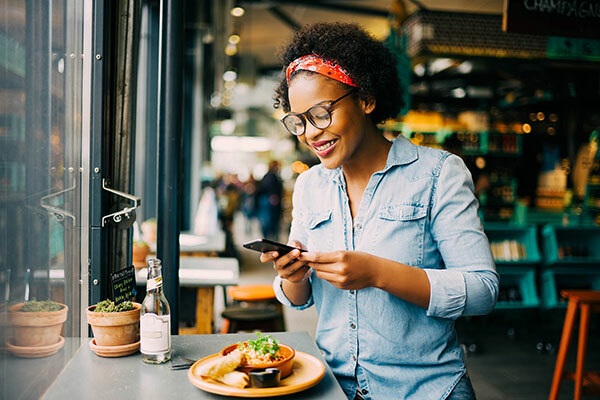 Retailers, restaurant operators and manufacturers have diverse opportunities to connect with consumers on solitary eating occasions — both with marketing and product innovation. CPG food manufacturers can connect with consumers relevantly by creating new forms of packaging and ingredients that encourage interactivity and a sense of personalization. Trader Joe’s is often praised by consumers for its two-person meal solutions. For food retailers, remember that consumers are cooking for themselves on alone occasions! Provide them with the meal components they need to enjoy this occasion.